Lenny Wolf Band is perhaps a more accurate band name as Lenny has been in the business for more than 30 years by now and the band has changed significantly over time. In 1983 Lenny left Germany for the US and soon released the debut of STONE FURY, plus a follow-up in 1986. When success eluded them Lenny formed a new band in 1988 to please the record company. Their eponymous debut was almost ridiculously close to LED ZEPPELIN but sold well, and the second outing, “In Your Face” is still a favorite of mine, and 1991´s “Hands of Time” is the illusive deleted one. 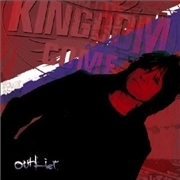 KINGDOM COME has since released a total of 14 albums, including this one. By now Lenny´s releasing the albums almost as if they were solo albums, but the latest line-up is Lenny, guitarist Eric Förster, bassist Frank Binke and drummer Nader Rahy. This album has a lot of gloom about it, leaving the heedless days of their successful eighties long behind. There seems to be a bit of effect on the vocal parts almost on every track and I think the overall impression is that of U2 meeting parts of the old bluesy KINGDOM COME. The song material is not up to par with their earliest releases in my opinion. The rather touted single “God Does Not Sing Our Song” is a rather heavy but spaced out opener. I quite like the melody and it is surely a bit on the unique side, but it also a bit depressing. There is a slight touch of stoner in “Running High Distorsion”, “Rough Ride Ralleye” is perhaps power pop and “The Traps Is Alive” is like the days of old but running on empty. The depressing pop of album closer “When Colors Break the Grey” is far from uplifting and the refrain is wafer thin. I quite like “Let the Silence Talk” with its U2 style and “Don´t Want You to Wait” which displays a lot of feeling and is the best song on offer. But that is nowhere near what I expect when I hear the name KINGDOM COME.